Tonight we had an uncharacteristically early dinner in that we were done eating by 7:30 PM, about two full hours before our normal schedule. You'd think that with all this extra time I may have cooked something extra nice! Not the case. Instead I simply used tonight as an opportunity to clean out the fridge, one of my favorite pass times. Besides, we'll need the space tomorrow when we inevitably get a bunch more lettuce from the farm share. 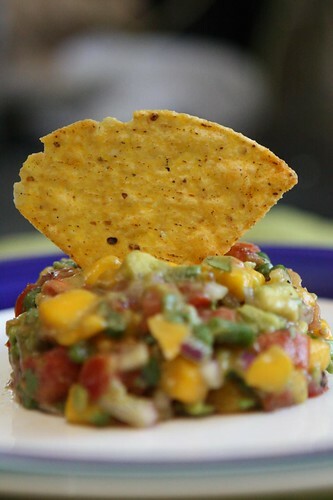 For a warm up I took the remaining salsa from last night's opah and served it with tortilla chips. Having a day to marinate the salsa was potentially even better today. I got some amazing lobster tails and immediately had a plan to make some sort of rice dish with them. When I got home I discovered that I only had about six grains of rice left in the bag after last night's macadamia nut rice. After scouring the pantry I discovered that I also had a good amount of polenta as well. What I did was brown some crushed garlic in butter and olive oil, toss in red onion, red and yellow peppers, a little jalapeno, and the remainder of a piece of chorizo. When this had cooked down nicely I tossed in some polenta, vegetable stock, milk, water, salt, and pepper then cooked it down for about ten minutes before throwing in some chopped cilantro. 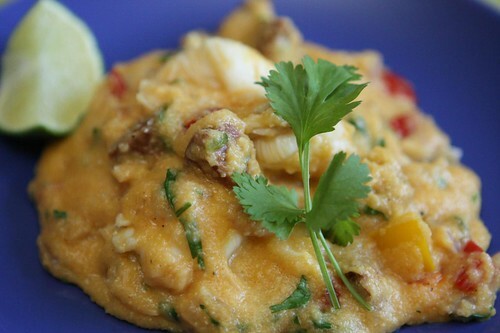 I thought that I should call this dish corn grits since I was using cilantro but instead I referred to it as polenta. Polenta with cilantro? Mama mia! 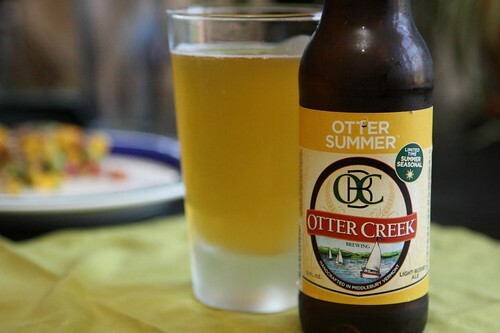 For a drink I poured this summer ale from Otter Creek Otter Creek. I didn't think I'd had this beer before until I tasted it and realized that it was actually just the same beer I'd had last year with a new label. This beer gets pretty lousy ratings on BeerAdvocate but I found it to be a nice match for this meal. Then again, I'm easily impressed. We rounded out the weekend with a showing of Airplane II: The Sequel to round out our Abrahams and Zucker weekend. I'm not sure how Jen enjoyed this weekend's movie lineup but I had a good time. To pay her back I'm going to have to watch a bunch of Bones with her. Actually, that's a lie. I can't friggin' stand Bones.